Pokemon the Movie: White — Victini and Zekrom hits theatres this weekend! Pokemon fans across America have been waiting anxiously for this this day to arrive and it’s almost here! On December 3rd and 4th, the newest full-length Pokemon feature film, Pokemon the Movie: White–Victini and Zekrom, is coming to more than 300 digital movie theaters screens across the United States. 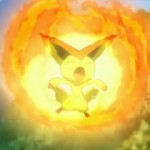 Pikachu – has been with Ash since his earliest adventures. The two of them are best friends. Victini – is rarely seen by humans. Legend says, this mythical Pokemon is deeply connected to the Sword of the Vale. Zekrom – Ash must awaken Zekrom so it can aid him in protecting the area. However, hes been hibernating with Reshiram. Reshiram – It is said that long ago, both Reshiram and Zekrom were connected to the Kingdom of the Vale. But after a great disaster, he and Zekrom have been sleeping in a secret location. 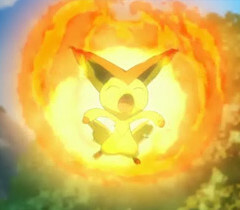 There are a few Pokemon that appear only in Pokemon the Movie: White – Victini and Zekrom. They are the electric type Pokemon Blitzle and the hard charging Bouffalant. Hydreigon – This winged Pokemon belongs to Carlita, Damon’s sister. It uses its six wings and three heads to attack an intimidate opponents in battle. However, he only has on central brain to control its various appendages. Reuniclus - The Psychic-type Pokemon joins Damon on his quest. This entry was posted in General, Pokemon News. Bookmark the permalink.